If a product has been created or updated in Shopventory, and syncing is enabled, that product will automatically synchronize to your POS. What does this task do? If, for any reason the update process from Shopventory to the point of sale hasn't yet completed, the system will report those products as "un-synced". 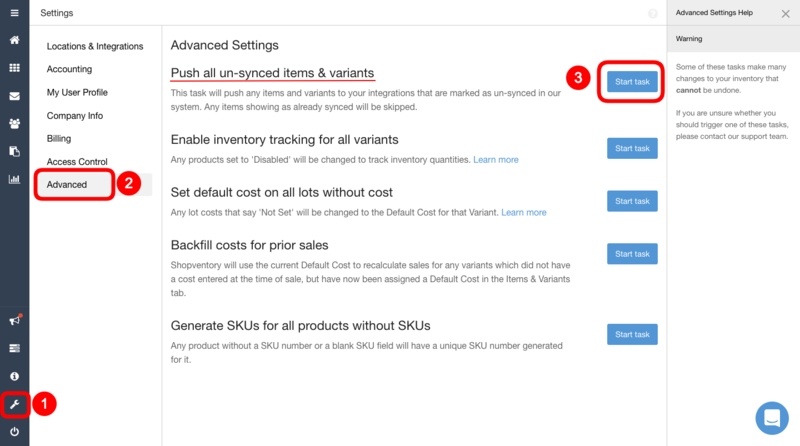 This task will manually push those products and variants to your enabled integrations. In other words, this will manually trigger a task that already runs automatically. The system will skip any products that are already up to date. If products are not appearing on the point of sale, follow the steps in this guide first: Products Not Syncing. This is not the same as syncing an individual Product from the Edit Product panel (step 4 in Products Not Syncing). This task should not be a part of your regular workflow. If you have to sync with regularity, please reach out and let us know.